The safe arrival of one's own baby is an amazing experience. How tiny he/she is. Look at those little fingers. He's got a good set of lungs. That newborn baby smell, the soft skin. I have watched as friends anticipate the birth of a grandchild. Once the baby is born they are eager to share the photos which melt the hearts of those who view them. At the moment there are baby swallows above our back door. Last year we derived a great deal of pleasure from watching the fledglings grow a little stronger and more independent each day. One took longer to learn to fly than the rest but then got the hang of it. And then one day they were gone. We were excited when we became aware the parents were lining the mud nest with little feathers this spring. We assumed there were eggs in the nest when we observed the parents taking turns to sit in the nest during the day. 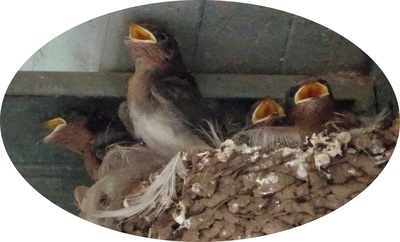 A few days ago we spotted a beak sticking out of the nest and now there are four fledglings with their beaks wide open waiting for their parents to feed them. It is a miracle and an uplifting experience to watch them developing. When a baby animal is born at the zoo, the event may even be announced in the media if it is rare for the particular animal to breed in captivity. It makes a nice change from all the stories of disaster and heartbreak and injects some hope into our lives. Puppies and kittens are so cute. Newly hatched chickens and ducklings are adorable. 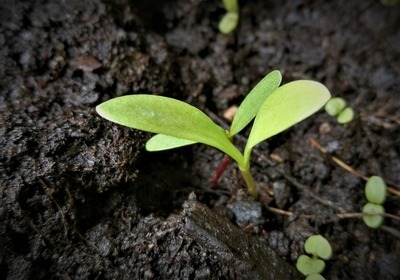 We plant seeds in the ground. Not all germinate but it brings joy when they do. It is truly magical to watch tiny seedlings growing bigger each day. 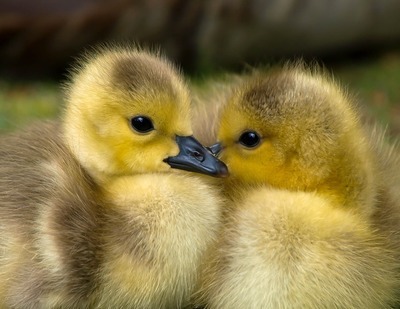 New life in Nature and our personal lives brings us joy. In the same way, creating art of some sort, writing or coming up with a new idea, increases joy.